After a mind-numbing election cycle and a distressing car accident, I dramatically deleted Twitter from my phone early last year, giving my brain a break from the creeping sense of exhaustion that was building up over the holidays. And when I finally did it, a fellow Twitter user offered a prescient, super obvious warning: “Make sure you don’t just trade addictions,” they said. Don’t just swap one bad behavior for another. Right, of course I won’t. I wouldn’t! I figured this would be easy. I can ignore Facebook most days. I’m bored with Snapchat. I’m on my laptop enough to stay active on Twitter without needing it to follow me everywhere I go. After abandoning mindless Twitter scrolling, however, I soon leapt to Instagram, because thumbing through photos seemed like a nice way to unwind. At first, the service seemed like a pretty good way to pry my eyes open in the morning—a bright light to steep in before I’d crawl out of bed. Then my feelings for Instagram changed. The anxiety I felt after blindly scrolling through tweets for an hour—the feeling that I was always working and never really letting anything else occupy my mind—was replicated by the endless stream of photos. And why Instagram? Was it the FOMO? The rise and fall of endorphin-inducing likes? I’m not sure. 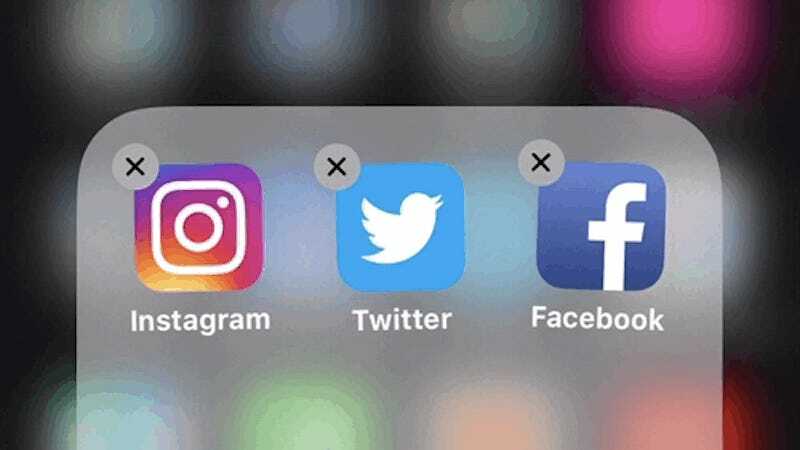 After months of launching Instagram at any bored moment, something I never did before deleting Twitter, the photo app became a checklist I would incessantly cross off. Instead of brewing in my own boredom while waiting for a train, I launched the app. In retrospect, this was something of a inevitability. Tech companies are really good at designing services that eat up as much of our time as possible. And it’s easy for us to plug holes with apps. To distract ourselves from processing anything by soaking up ever-more information. I have a feeling I’m not alone in doing this. But we can optimize what we do with our time, too, just like the tech companies. We can go for a walk without our devices and we can nervously thumb through a paper book and act like we’re not going through withdrawal. We can even continue using our phones—we don’t have a choice, right?—and we can proactively abandon some of the services that don’t make us feel good for whatever reason. It doesn’t have to be a whole thing. But it’s good to at least take breaks from apps that take up too much time and don’t give enough back. So what apps have you deleted lately? And what apps do you want to delete but haven’t? Does anybody else’s hands ache all the time? Tell me your stories! The comments are open.